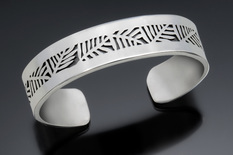 Original designed and hand crafted jewelry in sterling silver. Each jewelry piece is hand sawed, fabricated and forged. Specializing in bracelets with over 5 different sizes allowing each person an individual fit, for the smallest wrists to the larger ones, including men's sizes. They are fun to wear as a single bracelet or in groups, complimenting each other. Some jewelry designs include matching pieces.